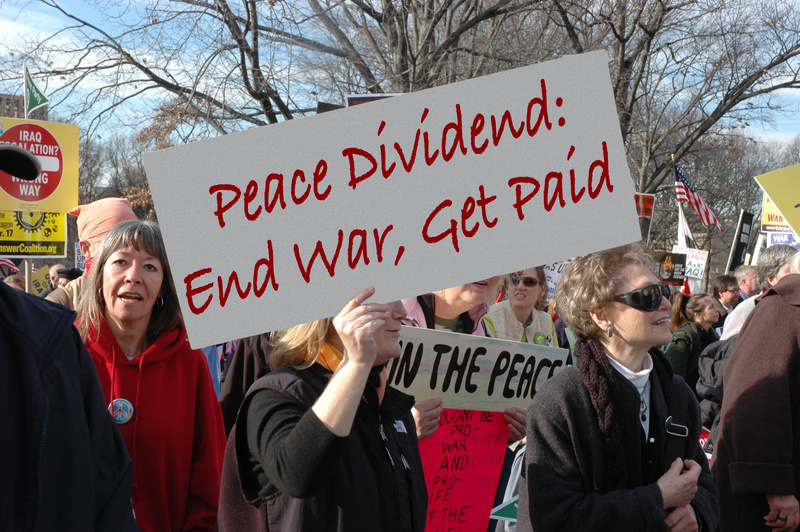 A peace dividend: end war, get paid! Ajamu Baraka, Green Party running mate in the 2016 presidential election recently wrote “Urgent: we need an anti-war movement to curtail the U.S. rogue state which continues to be a danger to the whole world.” Nothing could be more true. Before we can solve any of our domestic problems, it makes sense to work towards the single-most effective way to simultaneously save lives, free up money to invest in a greener economy, and directly take care of people: ending wars. Shouldn’t this be the number one focus of the Green Party, and that which most sets us apart from the parties in power? But perhaps the prospect of ending war may not be enough incentive alone for the majority of Americans to take action. As a seasoned activist in the antiwar movement, I’ve observed various strategies fail over the years. Some of us try to explain the impracticality of our wars to people, others try to appeal to conscience. Some flaunt their idealism and share their utopian visions of world peace. None of these things seem to have enough widespread appeal to connect with the masses. War has become so ingrained in our culture, and our oligarchs have so effectively sold the threat of terrorism and “evil” dictators, that most people turn a blind eye. And because it is waged far across the globe and with minimal American casualties these days, war is an abstraction to the majority of the populace. Many will be skeptical of this idea. Jill Stein ran on a platform which included cancelling student debt. Many of us had high hopes for the popularity this might gain for Greens, but were profoundly disappointed on election night. But there is a huge difference between promising to eliminate debt for a small subset of the population, and promising, say, $14,000 to every American household. In a report by the Department of Defense (DOD), it estimates that the wars in Afghan­istan, Iraq and Syria cost each U.S. taxpayer $7,500. According to the War Resisters League, 28 percent of our multi-trillion income tax revenue goes towards current military expenditures, with another 20 percent for past military costs, including veterans’ benefits and interest on the national debt, (most of which is estimated to be created by military spending). That’s a total of 48 percent of our taxes spent on defense. The point being, the money exists and can be made available for a peace dividend. But there are many people who are not at the starting point yet of realizing how wasteful and unjust our last 16 years of warfare have been. This is an opportunity to educate them about the fiscal costs of war, in addition to the concepts of blowback, the sham of the so-called “war on terror” which has only exacerbated terrorism, the consequences of regime change, the real reason we went to Iraq, PNAC, neoconservative ideology, etc. Money talks, and people listen, it’s really that simple. If national level candidates run on this platform, could the media really continue to ignore us? Will people really vote against their own self-interest? Could the Green Party finally win seats, and move our country closer to peace? Daniel Martin is a two-time Stein supporter and voter, and three-time contributor to Counter­punch.org. Active with his local, Lancaster County Green Party (PA), he is a member of 1040 for Peace, and a board member of Peace Action Network of Lancaster. A certain party, which I will leave unnamed, tends to be made of self-focused millionaires and those who hope to be (at least lately). If we also imitate their rhetoric, but use it to promote green values, this could work (especially if we can do it without name calling and cursing). Another peace dividend I have been stumping is the incentives for self installed or owned solar energy production, like SRECs.!.!. Distributed energy becomes distributed income that offsets the govt funded extremes of high medical and health costs along with the obvious costs of centrally produced electricity and transportation energy and it’s attendant pollution.!.!. !.